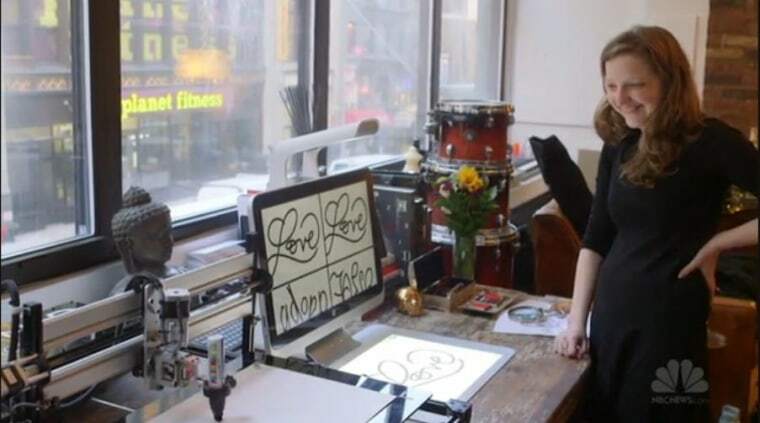 A New York City-based startup has created robots that can learn your handwriting -- and turn digital notes you write into letters penned on crisp stationery that look like you hand-wrote them yourself. The startup, called Bond, instructs customers to send in a writing sample. Calligraphers who work at the company help digitize the handwriting in part by hand-tracing the letters. From there, Bond's pen-wielding robots can convert typed-out notes into physical letters written on stationery the customer selects. Bond stuffs the envelope and sends the "handwritten" note to the recipient -- who may be a customer of a company that wants to send personalized notes in every order, or the guest of a bride and groom who used Bond to send their thank-you cards. It's a futuristic concept, but the cool factor of handwriting robots isn't really the point of Bond, says CEO and founder Sonny Caberwal -- a serial entrepreneur who is also a former Kenneth Cole model, corporate lawyer and bassist for the band Thievery Corporation. Instead, Caberwal told NBC News he was inspired by the idea of "digital things coming together with the physical world." He wonders: What does it mean for our culture, and our legacy for future generations, that we don't have the love letters and photo books that our grandparents did? That so much of our communications and connections are trapped in glowing rectangles that we toss every two years? "In academic circles you hear people talking about materiality," Michael Karlesky, a Ph.D student at NYU Polytechnic School of Engineering who studies human-computer interaction, told NBC News. "There's a pendulum swing to all of this impermanence ... which has become part of our culture without a lot of critical thought as to what this means." Caberwal also sees the beginnings of a cultural backlash around -- or at least a deeper meditation on -- the loss of permanence, physicality and legacy given how digital our world has become. "It's not to say that [ephemeral messaging app] Snapchat is bad," Caberwal said. "But certainly if there's room in the world -- there's a time and a place when you want your message to disappear, I find a use case where I want something to stay forever."